It’s probably fruitless, but any way that bike advocates can provide input for these projects? All three bridges could have a much better setup for cycling. Smithfield isn’t that problematic, but the other two are. I think that the Highland Park project doesn’t actually touch the bridge itself but is rather that widening of 28 next to the bridge so that there are 2 lanes of traffic on 28 both north and southbound. Penndot presented plans for this maybe about 5 months ago at a meeting at fox chapel area high school. THey’ve also been doing hillside surveying (they did this about 5 months ago also). I guess they’re still drawing up plans and waiting for money. they were very explicit that they wouldn’t be touching non-28 on/off ramps, as they didn’t want to get embroiled in the r47 development fight that was white hot last year in aspinwall. the anti-r47 crowd felt that this was a back door way to get access to the r47 development. @eric I think they are two different projects for the HP bridge area: one for the access ramps on the 28 side, which is the one you refer to, and one for the bridge itself several years down the line. It is still useless unless it connects to the Millvale trail. As far as i know it’ll never connect to the trail when it terminates in Etna at the riverfront park by the 62nd st bridge. Sharpsburg has said that after James Sharp landing it’ll run on the street, a la blawnox, until it gets to Etna. Re: Highland Park Bridge project in 12 year plan – as previously corrected above, but just to underscore: NOT the same as the Freeport Road bridge currently underway between Sharpsburg and Aspinwall. NOR is it the Rt28 widening project (whose scope does encompass the ramp cluster at the north end of HPB). Dan Cessna mentioned at a meeting I attended 2+years ago that PADOT would look to address HPB after the two above mentioned projects (and by the way, my recollection is that PADOT considers HPB to include the south ramps and Butler Street towards Washington Blvd as all part of the same scope/complex). In my experience with PADOT engineers, they value and will consider local input/feedback on this type of project. They have admitted they don’t experience these roadways and bridges they way locals do. As OP mentioned, the need of local individuals and advocacy groups to bring deficiencies and/or solutions to PADOTs attention is great. Take every opportunity to let them know the shortcomings and offer practical suggestions. I can’t find the brt thread. PAAC reapplying for federal money to build BRT. Seems the hold up is the federal government and possibly specifically the current administration, at least from what the county executive said. info about the Four Mile Run stormwater mitigation and how it may affect (effect?) plans for Oakland to Hazelwood connection. af·fect — əfekt – verb – have an effect on; make a difference to. ef·fect — əfekt – verb – cause (something) to happen; bring about. I would say that ‘affect’ is what you were looking for. Thanks. This is one of those things that I’ll never learn no matter how many times I try to learn it. so, wait. bikelanes from the GAP to the point are now back on? I’m confused. someone help me. my peabrain is exploding. Those will be welcome additions to the bike lane network! Connecting the GAP and Penn Ave lanes to point state park is a big deal. As I understand it the Blvd of the Allies bike lane was nixed due to business owners wanting to retain curbside parking. The new route appears to rely on 3rd ave instead. Lane width is at a premium down there so i’m hopeful actual bike lanes are put in rather than just sharrows. If 3rd is going to get a counter-flow bike lane, that seems to suggest that it will lose some on street parking. The block by gateway center could accommodate a lane losing only parking on one side of the street. The block to the east of that is narrower and only has parking on one side already. Hmmm. I assume where it says “contra flow bikelane” it means that third ave is one way there and the way going with traffic gets sharrows and the way against traffic gets a bike lane like oakland? Not really local news but don’t know where to put it. Strava, stolen bikes, and privacy settings. Pitt unveiled a 30 year master plan which has a lot of nods toward Peds/Bike safety and redesigning streetscapes. Nothing is set in stone, obviously, but glad to hear that Pitt has made this a priority along with building more buildings. City of Pgh possibly changing the way they prioritize cleaning streets this winter. So, biking is the fastest way for a car-less and frugal me to get from Point A to Point B. And thanks to the increasing number of bike lanes … Yes, I said it. I mean it. About 80 percent of my commute is either by bike lane or bike trail. In fact, if it wasn’t for the increasing number of bike lanes, I would not be riding at all. Are Complete Streets coming to your neighborhood? Attila Domos attempting world record on Uber track in Hazelwood this weekend. 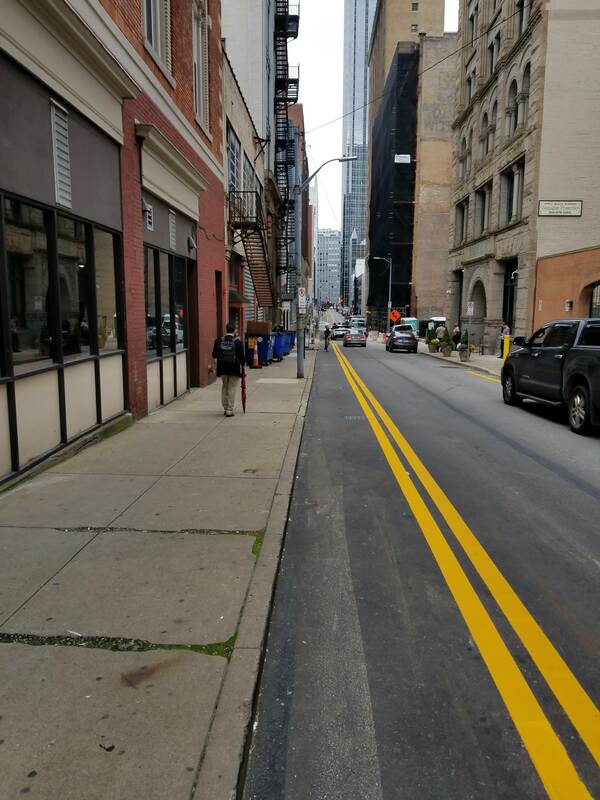 Bikes officially allowed to use bus-lanes downtown! What’s the “new 3rd Ave” facility they are talking about? PA may be able to put up speeding cameras and bill scofflaws by mail for speeding in work zones on turnpike and interstates per this new bill. @eric – Here’s the details of the 3rd ave facilities. To be implemented sometime in October 2018 I believe, for the first phase, which includes the 3rd ave contraflow lane. The 3rd Ave lane is in and painted. I am hoping that add a few bollards or something besides paint that helps drivers realize bikes are coming from the opposite direction. Also a few spots might need a sign to look for bikes to the left when pulling out. Not really local but funny. Who needs a smart bike lock? took longer than anticipated, but here is the 3rd Ave. lane with traffic and a cyclist coming up. Shot is from Smithfield looking towards Stanwix. Nice. I’m going to ride through this evening and check out the new lanes. Looking good! I like the use of yellow paint, but are there bike-only signs? Otherwise it suggests that motorcycles (or really narrow cars) can use it. I also worry that without separators that peds will walk off the curb looking the other way for cars and into a bike. The separators at least give a visual clue that something is different and to look out.